Client’s requirement is to possess a mobile app with aggressive testing to have friendly media sharing platform that will support for video gallery & information sharing. Client also need to have innovative way to receive feedback from audience for the personalization of video playing in various handy devices like iPhone, Android, iPad & tablets. Studying our client’s requirement, ANGLER’s quality testing team provided end – to – end mobile app testing services for their media and entertainment App. 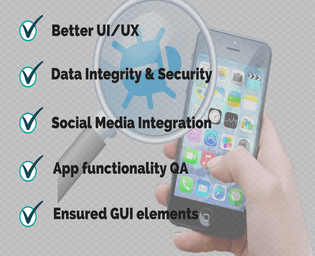 Our mobile app testing solution features in different OS versions. Since the application is based on media and entertainment, we have done various mobile app testing like functionality, UI / UX testing, data interruption, user experience, integration, etc. we extended the mobile app testing across wide range of platforms in handy devices like iPhone, iPad, Android mobiles & tablets including integration testing on social media integration like Facebook, Twitter, Rediff, Pinterest, Google+ etc.